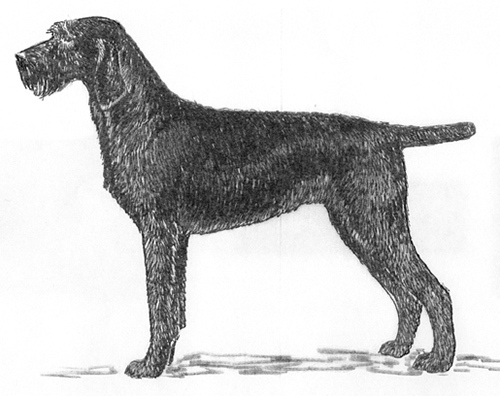 The Pudelpointer originated in Germany, created by crossing the Poodle with the Pointer. A versatile, genetically sound and healthy gun dog emerged from this cross. The breed is useful for all kinds of work in the fields, woods and water. 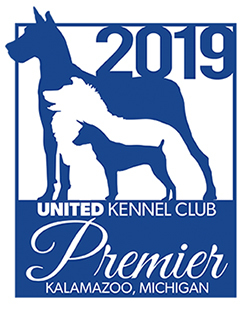 The Pudelpointer was recognized by the United Kennel Club in 2006. A Pointer of heavy type with a rough, not too long coat that is dead leaf or black in color. A calm, self controlled, even temperament with a strong hunting instinct. The skull is flat, moderately broad, and rounded at the sides, with pronounced superciliary ridges. In balanced proportion of length and width, neither narrow nor pointed, with a straight nasal bridge. The muzzle is the same length as the skull. The Pudelpointer has a complete set of evenly spaced, white teeth meeting in a scissors bite. Disqualifications: Overshot, undershot, or wry bite. Strongly pigmented according to the color of the coat. Large, set at the sides of the head, dark amber in color. The lids are tight and the expression is lively. Medium sized and set on high, flat lying, with rounded tips, and well covered with hair. Medium length, slightly arched, no dewlap. The shoulder blade is tight fitting, and forms a good angle with the long upper arm, setting the legs well back under the body. Straight and parallel with strong bones and joints. The elbows are close to the body, and the forearms are long, lean and well muscled. The pasterns are slightly sloping. In proportion, the body is slightly longer than tall in a ratio of 10:9. The chest is broad and deep, and the ribs are well sprung but not barrel shaped. The withers are pronounced, and the back is short, straight and firm. The loin is well muscled, and the croup is of medium length and slightly sloping. There is a slight tuck up in an elegant curve. Faults: Swayback or roach back. Viewed from behind, the legs are straight and parallel, with strong bone. The upper thigh is long, broad and well muscled. The stifle is strong and well angulated. The lower thigh is strong and sinewy. The hock joint is very well angulated and the rear pasterns are short. Faults: Barrel legged, cow hocked, or close behind. Round or oval. and well knit, with not too long hair. Set on in an even, unbroken line with the croup, the tail is straight, and should not be carried steeply erect. It is generally docked, but if natural it should reach to the hocks and be carried saber like. Close, flat lying, hard rough coat of medium length, with dense undercoat. The head shows a beard and a forelock. The coat on the belly is close and dense. The coat should provide strong protection against the weather and injuries. Faults: Coat too long, too thin or lacking undercoat. Disqualification: Lack of a beard. Solid brown, dead leaf or black, with or without small white markings. Disqualification: Any color or marking not specifically mentioned in the standard. Height at the withers for males is 23.5 to 27 inches. For females, it is 21.5 to 25 inches. Upstanding, far reaching and springy, straight and parallel coming and going. Fault: Stiff or mincing gait. Any color or marking not specifically mentioned in the standard.